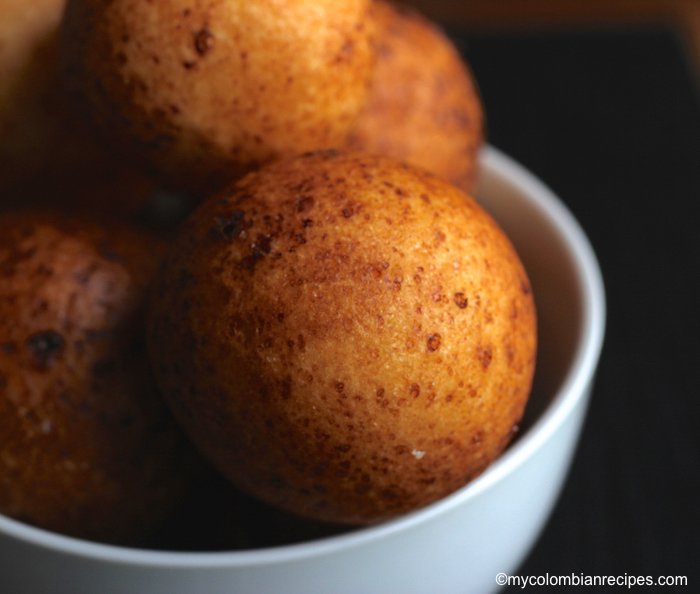 Buñuelos are a traditional Colombian Christmas treat, but they are also popular year round for breakfast with hot chocolate or coffee. On December 7th in Colombia, friends get together to celebrate “el dia e las velitas”, a Christmas tradition in honor of the Virgin Mary. They light candles in front of their houses or on their balconies, cook traditional Christmas treats, like Natilla, Buñuelos and Hojuelas and of course, they party :). Now let’s talk about this Buñuelos recipe. 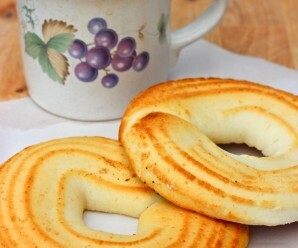 Traditionally they are made with Costeño cheese (Queso Costeño) which is a Colombian white cheese that is a little saltier and harder that Queso Fresco. I used feta cheese for this recipe because to me it’s the most similar cheese to Queso Costeño that I have found. I have to tell you, this recipe gave me a lot of trouble. Now that I’ve made this Buñuelos, I have a lot of respect for buñuelo makers in Colombia :). I know the Buñuelos don’t look very attractive, but they taste wonderful. They are the right consistency inside but it was a bit difficult to get the correct crust consistency because the oil temperature has to be perfect. Feliz dia de las velitas and enjoy! Place all the ingredients, except the oil in a medium bowl and mix well using your hands until soft dough is obtained. Form small balls using your hands. In a deep pot, heat the vegetable oil to 300°F (Warm, not very hot). Carefully drop the balls in the warm oil. Cover the pot and after about 3 to 4 minutes, turn the heat up and fry until golden brown. Remove from the oil and drain on a plate lined with paper towels. Serve. To me they taste like fried cornbread. These go great with a cup of hot chocolate as the author stated….muy bien! Approximately how many bunuelos does this recipe make? How much oil do I use to fry them? Thank you. Your answers depend on the size of your pot and the size of your balls. 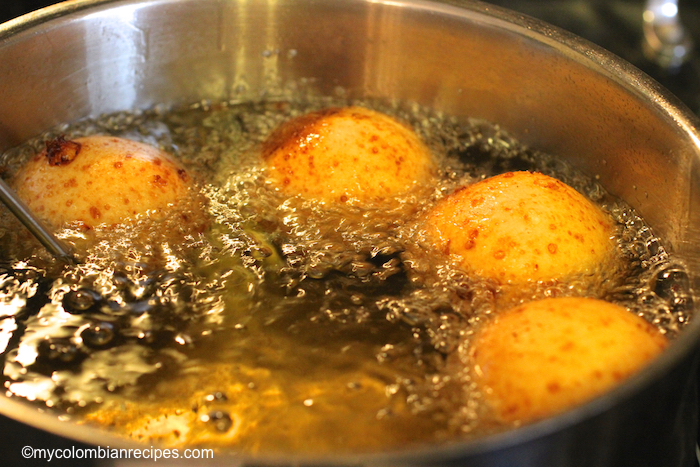 The easiest way is to make all your balls the same size and then add enough oil to cover the balls. is another name for it. Those look amazing! I love your blog because every post is something that I haven’t seen before and is something I want to make! Oh wow..They looks so yummy…i love yucca..An important dish in Kerala cooking too..
where can we get Yucca flour from?? You can buy Yuca Harina Colombiana or GOYA Yuca Harina through Amazon. Hope you have a wonderful and fun time at the festivities…! Oh my, I’m drooling!…These look sooo good! I can say I have never had these, but want some now – if I knew these little globes of heaven were an option, I’d never leave the breakfast table. Erica, you’re getting me into serious trouble now! I have heard of bunelos before, but never knew they had cheese in them! I bet they taste great. I’ve never tried these but they sure look delicious! all that cheese and frying……YUM!!! I love your buñuelos. In Greece we call them tyrokroketes (cheese croquettes). I have not made them yet but now I feel like making some. oh, yummy yum, that’s a delicious cheesy treat!!! sounds absolutely delicious!!!! I’m pretty sure you can’t go wrong with fried cheese AND partying. 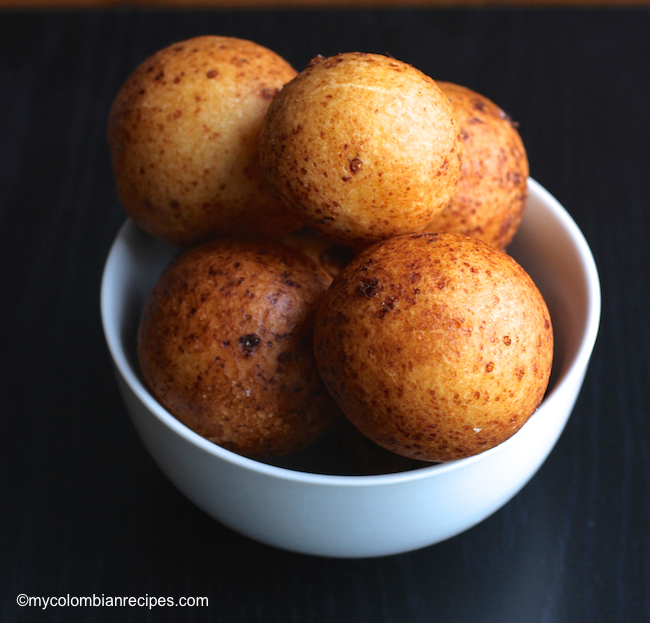 Great recipe and thanks for the description about this Colombian holiday! Encantadisima de encontrar este sitio, especialmente por los ingredientes que usas, ya que son faciles de conseguir en otros paises. Desde ahora esta familia sera una fiel seguidora de este blog. Ya te contaremos como nos quedan la natilla y los bunuelos. Ojala puedes publicar algo para navidad. Thank you. My 8 year old daughter will be SOOOO Happy, she has been asking for them. I’m so greatful I found your site. What are you talking about? These look attractive to me. They look delicious, really. At first, I thought it was a savory treat, but then I found out it’s a breakfast item. And a breakfast item to be had with hot chocolate too! Oh, my. I’m definitely making these. I love buñuelos! I make mine a little different- I use half queso fresco (or blanco) and half queso cotija (mexican parmesan cheese-pretty salty). I also add harina pan (corn flour) to mine it gives it a nice crust on the outside. I put it in a food processor until it forms a dough. 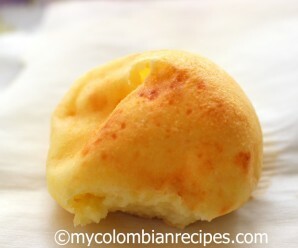 I found a recipe from one of my colombian cookbooks and tweaked it up! 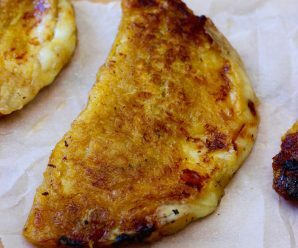 The cheese makes all the difference with almojabanas, pandebono and buñuelos! And you’re right-the temperature of the oil is crucial. These are my favorite with cold coke! OOOh Erica, me encantan estos buñuelos! Me gustan mucho!!! Muchas Gracias por tu receta! Erica, instead of feta cheese try “queso Cotija”. It’s very close to the “queso Costeño”. Where we live we can find it at WalMart. It’s a mexican cheese like “queso fresco”. My husband uses it to make “pandebonos”. Adriana- Thank you so much! I am going to try it next time. Mmm those buñuelos look delicious! I was wondering if you tried to incorporate an egg. Perhaps is because the yield is not in a larger quantity, it doesn’t affect the recipe. I also add a little baking powder. Wondering if you have a recipe for Pandebono with ingredients in the USA. Sam- I am going to post the pandebono recipe this week. They are delicious and my familys version taste potatoish.. I highly recommend those Bunuelos. They are very delicious. Has anyone had a fried Arepa with egg. A lot of people from the coast of Colombia usually eat that. At first its hard to make but once its cooked its a reward. We live in Australia and are also unable to source Queso Costeño. My mum instead uses ricotta and it is my favourite Colombian dish that she makes. I have just stumbled across this site and I look forward to exploring it more and passing it onto my friends and familia! Yo estoy en NJ y acabo de hacer bunuelos y quedaron perfectos… pense que valdria la pena compartir con Uds una receta que funciona usando ingredientes que se consiguen en un supermercado normal. Segui la receta que esta en Youtubeyoutube.com/watch?v=kCugjQ40fu8. Hi Erica, Thanks for the recipe although I’ve tried it already and for some reason I cannot explain for me it was a disaster, maybe I’m doing something wrong? But I followed every single step of it. Anyways it may for the lack of Colombian ingredients available around my area (Williamsburg VA), nonetheless Thanks. Juan- This is a hard recipe! I made it different times and and it is not an easy recipe to make! The oil has to be at the right temperature. I made the bunuelos, but it it is a little complicated, but they tasted delicious. I use a store bought box for bunuelos , i live in miami and every supermarket has it. And i use cotija chese, or you can use a hard white cheese. It was hard work but worth it. 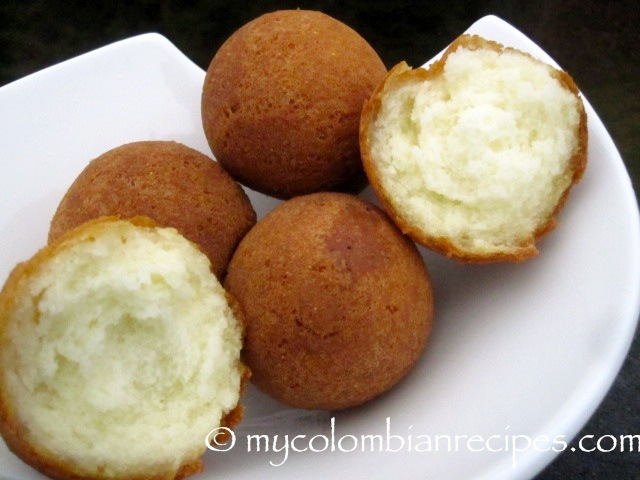 As Erica said this are a little tricky to make, I found a recipe that gives the same texture and taste as the ones made in Colombian bakeries…here the recipe. 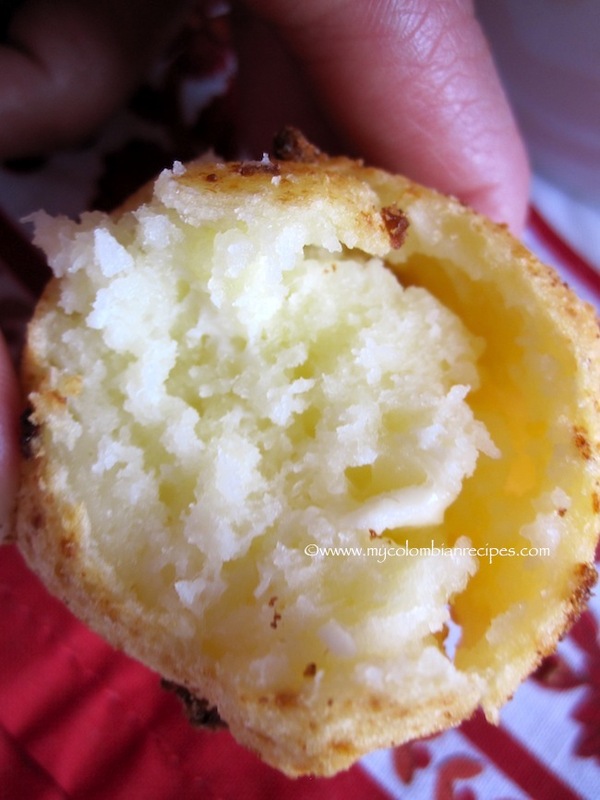 Where can I find yuca flour? Love your recipes. Thanks. Patricia- I find mine at my local market. Erica , a little curious about why there’s no egg on your recipe. Is the feta cheese moisture enough to make the dough ? I would love to confirm these two ingredients on your recipe before trying. Hi Vivian- I followed my aunt’s recipe and she doesn’t add egg to hers…..I changed the queso costeño for feta cheese. Gracias, mujer! My mother is Colombian and I was born and raised in NJ. I lived there all my life but spent endless summers in Colombia as a child and as an adult. Once upon a time, I could go to my neighborhood in Paterson and get a bunuelo whenever I wanted. Now I live in FL, the side of FL that only has one very pathetic Colombian restaurant that doesn’t even have this on the menu. It’s been almost a year since I’ve had one. But now with this treasure of recipe I found, I will be able to bring a taste of home to our Christmas this year. Keep it up, chica! This blog rocks! PS I’m looking for a Mantecada reciepe too. I’ve yet to taste anything here in the states that comes close to what I tasted back in my 2nd home away from home….Colombia. Hi! I want to make these for xmas but I need to know how high do you turn up the heat after you cover the pot? If you are able to find the Greek cheese called Kaseri, it tastes even closer to queso costeño than feta. It is usually in the specialty cheese case by the deli at Publix. 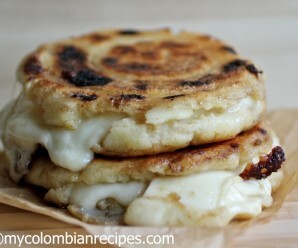 Hola Erica, una amiga colombiana me dijo que usa un queso llamado “cotija” para hacer sus buñuelos (deliciosos de hecho) Lo conoces, lo recomiendas? mi hija me tiene loca pidiendome que le haga “bolitas” desde que fuimos a visitarla, pero no me he arriesgado todavia. Como mides la temperatura del aceite? un termometro de carnes funcionara bien? Soy colombiana y vivo en California, así que no me es posible conseguir el queso costeño que tradicionalmente se usa en Colombia para hacer los buñuelos. 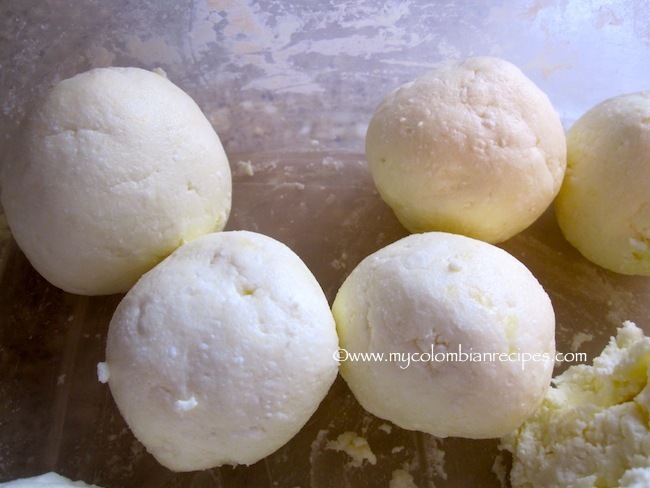 Generalmente cuando hago buñuelos uso una mezcla de queso fresco mexicano y queso cotija (60/40). Me parece que saben ricos y el sabor es parecido a los que hacemos en Colombia. Antes de fritar los buñuelos mido la temperatura del aceite echando una bolita pequeña de masa al aceite caliente. La idea es que el buñuelo flote en cuanto lo sumerjas en el aceite y que se voltee solo, hasta que esté completamente dorado. Si los buñuelos se rajan mientras los estas fritando es porque el aceite está muy caliente. A Erica, muchas gracias por compartir tus deliciosas recetas colombianas. Leerlas me hace recordar la sazón de mis abuelas!! Se parecen a las “almojabanas” que hacemos en Puerto Rico! yummy! Hola, Erica. Siempre vengo a tu blog cuando quiero cocinar algo que me haga sentir en casa. Ayer hice un “trial run” con los buñuelos y todo salió perfecto: controlé la temperatura, se estaban volteando solitos -hermosos!- y salieron súper ricos; redonditos y perfectos por dentro, solo que el exterior quedo muy crujiente y un poquito grueso. ¿Será que esto se debió a la improvisación de los quesos (Feta y Cottage escurrido) o depronto mucha fécula de maíz? ¿O depronto la temperatura o tiempo de cocción? Muchas gracias por todas tus recetas. Un abrazo desde Abu Dhabi! Hoy hice estos buñuelos y seguí la receta al pie de la letra pero no me quedaron muy bien que digamos. La masa quedó muy aguada, entonces le eché más harina de tapioca hasta que me fue más o menos posible hacer las bolitas, pero igual no quedaron como esperaba. Qué puede hacerse en ese caso, cuando la masa queda muy aguada? My mom is from Medellin and she wants to try and make buñuelos herself, but she is wondering if she can make the dough and store it in the fridge for a day or two? Hope you can answer this! Love your blog by the way 🙂 You have so many delicious recipes! I don’t know, I always fry them the same day, but she can try it! My mom (Margarita Jaramillo) just tested this out, we fried dough we had made the previous day and it worked out great! Took a little longer to fry initially because the masa was cold from the fridge, it may make it a bit more oily so maybe get the masa closer to room temp when frying it. Podrías decirme para cuantos buñuelos es esta receta? tried feta cheese, I do not like the taste of it, my guest didn’t either. Absolutely wonderful. I made these this morning for my Colombian exchange student, and she gobbled up 3 of them! She said they were perfect. 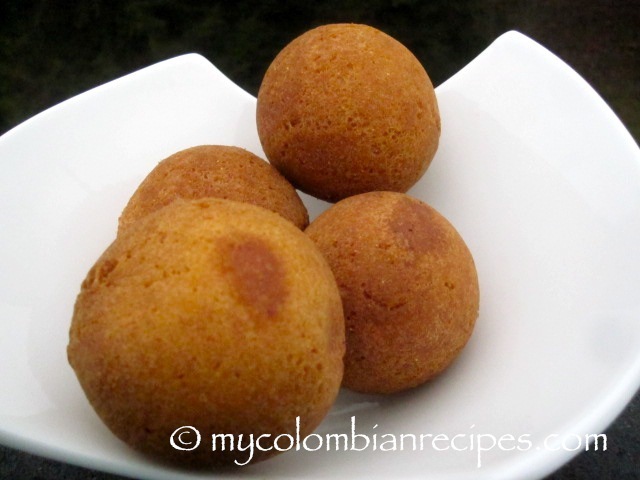 I used a heaping tablespoon to form my buñuelos, and this recipe made exactly 9. I also used a candy thermometer to get the oil right at 300°. I set the stovetop on 4, or just above medium-low, and it took about 15 minutes to get up to the right temperature without getting too hot. Thanks, Erica! This is a keeper! I want to try this recipe soon. I will let you know! Thanks for posting! Your blog is literally the savior of my family legacy. I moved from Colombia as a little girl and never went back and never learned how to cook anything at all. But you have saved our traditions through your blog and there are no words to thank you!